Often times people as me why I chose the medical field of Podiatry. My typical answer is that I have had injuries in the past that have needed surgery and wanted to be able to perform surgery on people that need it. It also gives me the opportunity to work with athletes, which I enjoy. Although these are true, another reason is to work with diabetics that have foot and other health issues that need addressed. Diabetes is a disease that I am very familiar with as my father struggled to manage his diabetes. Diabetes is currently one of the largest epidemics in the United States with almost 10% of the population (21 million people) having diabetes. This number has been on the rise over the past couple of decades, and an estimated 8 million people are living with diabetes that have not yet been diagnosed. People with diabetes tend to develop problems with their feet for many different reasons but probably the most critical is due to diabetic peripheral neuropathy. The high blood sugar in diabetic patients leads to peripheral neuropathy which affects the sensation and moisture in the patients feet. Many people with diabetes have decreased sensation in their feet and may not even realize it. This leads to developing ulcerations in areas of pressure and friction although it usually will not cause pain. This is why it is very important for people with diabetes to not walk barefoot and check their feet daily. It is also important for them to be evaluated by a Podiatrist regularly to check for issues that may lead to wounds. Wound healing in the diabetic patient is not an easy task. People with diabetes are immunosuppressed due to their high blood glucose. I often tell patients “any day your blood glucose is over 150-175mg/dl is a day your wound will not heal”. Other important factors are wound debridement and proper offloading of the wound to prevent pressure on the wound. It is very important for someone with a diabetic foot wound to be evaluated and treated by a Podiatrist as soon as possible. The longer the wounds are present, the more chance of them becoming larger, deeper, infected and developing eschar which all lead to higher rates of amputation. 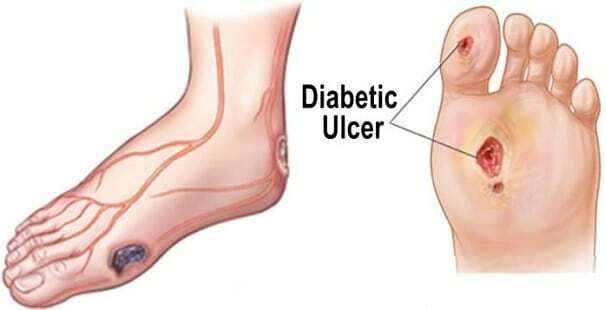 Many patients with diabetes are covered by insurance for yearly diabetic shoes, which can help prevent these ulcerations from occurring. I have a lot of experience with treating diabetic foot wounds and infections in my years working in a wound care center at Rush University Medical Center. If you have a diabetic wound or are worried about developing one, you should call today to make an appointment.